Wait…what? 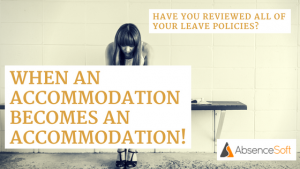 Have you ever had an employee who needs an accommodation at work? Of course you have. You’re a good employer who knows that it is not only the law, but it’s actually far less expensive to put a few accommodations in place than to go through the expense of a new hire. Let’s chat about what you’ve done so far. You received an indication that an employee has a medical condition that is impacting their ability to be successful at their job. You engaged in an interactive process to work with the employee and discuss the type(s) of accommodation(s) requested. You requested medical documentation in those instances where the disability or the accommodation was not obvious. You have identified a couple of different options and even tried some of them out. The employee is working with you to really try to make it work, by staying in communication, giving feedback, and being open about alternative suggestions. But, alas, the employee is still struggling and it looks like the best option is a two or three week absence, so they may get back to healthy. No problem, it’s a short ride to FMLA Land! We just give the employee a certification form for their healthcare provider to complete and we’ll see them in a few weeks. Right? Well, it appears this employee has no FMLA. Maybe they’ve only been with you for 10 months or maybe they used it all up in the spring when their mom had a terminal illness. Now what? Yup, back to the Accommodations process. What should you do? You’ve already established that there is a request for an accommodation. You must remain very engaged in the interactive process and be sure to have open, documented conversations with the employee to determine if an absence from work will provide them the ability to come back to work. You must review the medical documentation and determine if the employees’ condition is one which might benefit from an absence from work. You should have a conversation with the employee to determine exactly how long the absence will start and at what time you will check in with each other. THIS IS DIFFERENT THAN FMLA!!! Under the FMLA, the physician usually identifies a period of incapacity and we sit back and wait until that ends. You have a conversation early and often for what the process will be. All done….right? No (but you saw that coming). Among all of that, don’t forget to also review any and all other leave policies within your organization to make sure you have not violated any of their requirements or put greater expectations on this employee with a leave request than you would have for another employee requesting roughly the same length of time under another leave policy. For example, you have an option where employees may take a three week sabbatical type leave once every other year and it does not have to be due to a medical condition, therefore no medical would be required. 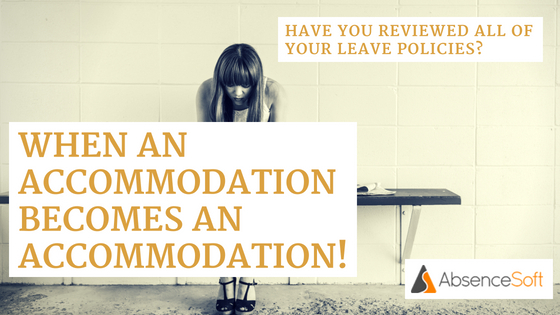 Tricky, but incredibly important that there is not even a perception that employee requesting an accommodation has a higher bar to meet. Exhausting, I know. But wait until you read the blog about…hmm….don’t want to give it away. Stay tuned!